Powered by a lightweight, rugged "industrial engine," the 10.3 EGTD continues to support the strong record of reliability Westerbeke has built supplying product to the United States Navy and Coast Guard as well as commercial vessels and pleasure craft world-wide. 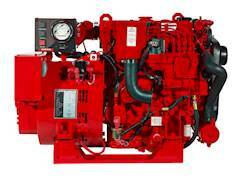 The 10.3 EGTD's robust 1.76 liter engine provides additional capacity to manage some momentary motor loads that may "bog down" similar generator sets limited by engine power. The 10.3 EGTD provides 4–cylinder smoothness and a tuned air intake silencer for quiet, slow speed operation. In addition, standard electronic governing maintains the engine at a constant speed virtually eliminating "droop" when load is applied.